Dragon Aviation is the sole importer of Aeroprakt Aircraft in the UK and Southern Ireland. The Foxbat is a very short take-off and landing (VSTOL) aircraft. With a range of available propellors, being set as required; both the LS and notably the L2 can achieve breathtaking climb performance without compromising very respectable cruise speed. Larger wheel & tyre combinations are also available options for more ‘outback’ capability. In all configurations, the Foxbat control response and feedback allow confidence and trust to be developed, especially for tight entry/short field approaches and the like. 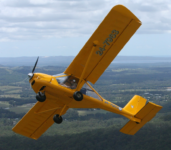 Stalling is a non-event, with or without flap, as there is no tendency to drop a wing and you can therefore side-slip safely with confidence and authority. The doors are glazed to the floor, the windscreen is vast with clear views both upward and behind. If you’re just sightseeing, you can see straight down without banking for unimpeded views and camera shots. The outstanding all round visibility is however an enormous complement to safety for both short field or busy circuit traffic scenarios. The Foxbat A22LS SuperSport 600 is the latest Light Sport generation of the proven A22, which has smaller aerodynamic surfaces and gives rise to sportier handling. Additionally, the A22L2 Microlight also benefits from the design enhancements of combined research developments. In both cases however, both the LS and the L2 retain the remarkable short field performance. The A22L series Foxbat is predominantly aluminium construction, not a rag and tube aircraft with primitive design and construction techniques. Most of the rivets are aviation “buck” rivets, with very few pop rivets. Final assembly riveting is not required by the builder as apprentice served aircraft fitters complete all structural riveting at the factory. The quality of the manufacture and fittings is not usually found in this class of aircraft and this is worth comparative observation. As one example; the wing mounting points have self -aligning spherical bushes fitted and indeed, wherever a bolt is used as a pivot, there is always a spherical bush or bronze insert fitted to minimise friction and wear to provide security and service longevity. The assembly process is straightforward and can be completed without assistance where a small workshop or single garage could be used comfortably. That said, full ongoing support is in any case provided here in the UK by the importer Dragon Aviation; via vastly experienced guidance and comprehensive documentation. Watch some of these amazing videos to see how well the A22 handles and what fun you can have! My first Foxbat required extensive wing repairs (my fault) but Dragon Aviation made an excellent job of it and it flew as if nothing had happened. After it was destroyed, another Foxbat happened to be with Dragon for repair when the owner decided to quit flying. I purchased it after seeing for myself that the repairs were up to Aeroprakt standards – those flush rivets take real skill to get right! Ray has always been there on the end of the ‘phone & when he’s busy, he always rings back. For the most part my questions have been elementary and Ray has been most patient in translating my vague descriptions into straightforward solutions. From early on, it was clear that Ray has an excellent understanding of engineering and an ability to eschew obfuscation (OK….keep it simple).